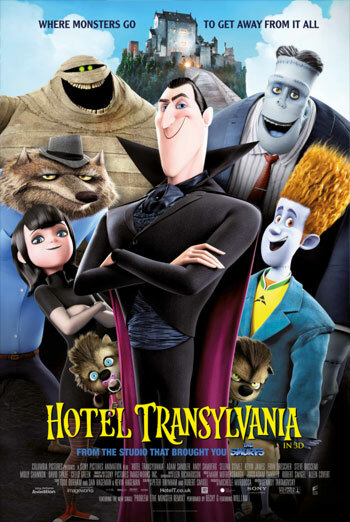 HOTEL TRANSYLVANIA is an animated comedy about Count Dracula's attempts to protect his daughter Mavis from the dangers of the human world by opening a hotel for ghouls and monsters. The film plays with the traditional idea of horror and ghost stories by turning apparently frightening monsters into likeable characters who become involved in all sorts of comedy and slapstick. Although the monsters are initially introduced as being scary, they are rapidly revealed to be funny and caring characters. There is some mild rude humour involving characters passing wind or animals leaving pools of 'pee'. However, this is comic in nature and serves to balance the occasional scary moments rather than being offensive. HOTEL TRANSYLVANIA - INTERNATIONAL TRAILER C ("COMING SOON"),HOTEL TRANSYLVANIA - INTERNATIONAL TRAILER D ("COMING SOON"),HOTEL TRANSYLVANIA - INTERNATIONAL TRAILER B ("COMING SOON IN 3D"